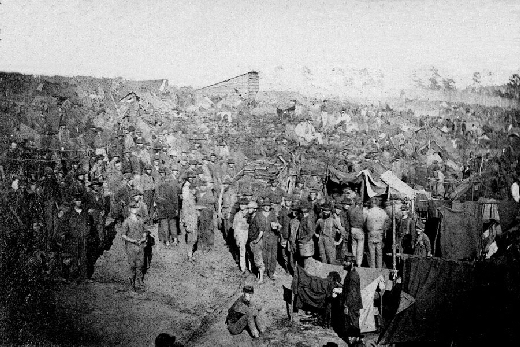 The Confederate Prison (POW Camp) Andersonville, GA. 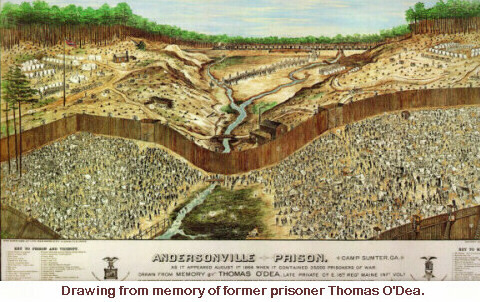 Looking into the real conditions found at the Andersonville Prison, can only be understood by envisioning 32,000 prisoners confined to an area designed for around 10,000. No clothing, no shelter save the makeshift tents (pictured below), and very little food, ( half pound of beef or bacon, and a pound and a half of cornmeal - each day). Is it any wonder that through the life of Andersonville Prison, that over 50,000 men of the Union went through here, that many many died here? ( approximately 13,000 ). Death, disease, were commonplace, with little or no medical attention, the men were left to care for their own. As I looked through the various pictures, and read the accounts of the attrocities that occured here, and whether right or wrong, the end of the War brought the Camp Commander Col Henry Wirtz to face a War Crimes trial in Washington DC, and he was Hanged.